Now that the economy is in a recession, we made a widget that might cheer you up. 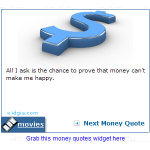 This money widget has some funny random quotes. Grab the widget and let your visitors have a laugh or two in these recession days.